During the lull at the IEP meeting, when i's are dotted, t's are crossed and photocopies made, I chat to the other team members. I remark about how well the play dates have been progressing with the child we called Joe, in my older son's class; what a delightful boy he is, so sweet natured, such language facility, how my boys are able to 'share' him, how patient he is with them both, how's he managed to magically lure them outside……I glance up when I realize that I am rambling, to check that we are of one accord regarding Joe's outstanding personality, so that they may contribute to his adulation, that “paragon of virtue,” lucky boy, lucky family, lucky school. I see widened eyes and electricity pass between them. For as long as I can remember I have had a healthy respect for this truism. I used to be somewhat fearful and cautious about these differences, but in the light of Joe in my home, with my children, whatever the truth of the matter, in my eyes, Joe showed his true colours, the rainbow that he is and the hidden treasure. Posted on May 19th, 2007. Of course the disappointment stems from faulty expectations on the part of the parent, but it stings none the less for that. I think most parents find that the pin pricks of their children feel like personal stabs. It's part and parcel of being the adult. If you are the adult, then it should be you who is the rational being and dismisses these petty hurts. When you see the real glee in the typical child's eyes on arrival for a play date, your chest swells with vicarious pleasure. When you explain that 'electronics' are not permitted until 5, you also recognize disappointment in the visitor. The declaration of universal boredom, coupled with discrete enquiries as when mom will be collecting, tells you really all you need to know. But it is delightful to clock the social skills of your own children, as they attempt entertainment, joke telling, alternative toys and different options. Each accommodation is offered verbally, in a reasonable tone of voice, evoked from genuine concern. They also cope with the repeated rejection, that nothing is acceptable. But when the sulks come on, I have to acknowledge that they have reached their current limit, as they have exhausted their stock of social skills. Their bank of social skills, is larger than I had appreciated. They look at me for a cue or possibly a clue. The guest hides under the stairs, but he is young. I guide my boys away to let him cool off. Admittedly this is a best case scenario, when my boys are on their own home territory. They may not be able to repeat the ‘exercise’ elsewhere. [translation = inability to generalize skills] As a pair, they were able to help each other fill in the gaps and probably would not have done as well on their own. Nevertheless, in my mind it is a coup. 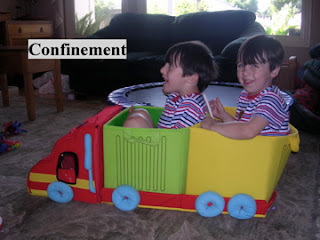 All children have 'off' days, [translation = bad ones] but it wasn't my children who sulked. They’re so few and far between, those opportunities to crow, so I hope a small gloat, once every 12 month, doesn’t count as a mortal sin! Posted on April 12th, 2007. 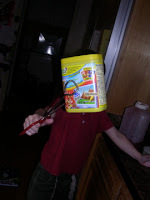 A few years back, Junior repeated his school year in his special education class. [translation = retained?] The Pre-K teacher was a speech pathologist by profession and had more than 30 years experience with little chaps and chapesses of my son's ilk. Tiny modest benchmarks were recorded on his IEP chart. Whilst there was a little tick here and there, other elements seemed to have vanished. Carefully acquired skills had slipped from our grasp. For me, his new achievements were over-shadowed by the thought of the ones that we seemed to have carelessly mislaid somewhere. I think I was in the 'generalization' phase. 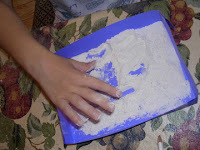 In case you are unfamiliar with this term, for current purposes, it means that when a child learns a new skill, such as tolerating sand at the beach, in theory, they should also tolerate sand in other situations, such as school, a sand pit in the garden, a washing up bowl full of sand and preferred toys etc. If the tolerance of sand, remains solely at the beach, then he has 'failed' to generalize. It felt like a double whammie, not only did he suffer from “tactile defensiveness,” but any progress we theoretically made, remained strictly in the geographical location where he first acquired it. He also has a parent whirlizting away on yet another campaign. At that time, junior's failure to generalize just about anything, was a cause of deep frustration for me. He learned to eat bananas, but only at home, that is to say, not in the car, not in the garden, [of course] not at school nor the park. I believe I read “Green Eggs and Ham,” until I was the same colour as the eggs, and every bit as cheesed off as that rotting food stuff. He would hunker down on his favourite, [translation = only chair] whilst I forked slices of banana into his open baby bird mouth. He would not 'bite' into the banana and shock his teeth. His hands could not tolerate touching the banana with the skin and the idea of contact with a naked banana would send him into an apopleptic fit. He would not chew the banana but swallowed the lumps whole, as his mastication abilities were as feeble as my own. “No fork, no eat,” were his watch words. It takes a long time for fork a whole banana into a three and a half year old, three times a day. The time factor features heavily if you are also obliged to spoon feed the five year old his different dinner, at the same time. The combination of the tactile/oral defensive small one, and the sequencing/ co-ordination/fine and gross motor challenged older one, resulted in an ambidextrous mother with very dirty clothes. But “neophobic” was yet to be part of my vocabulary. His teacher, in her professional capacity, was a remarkably conservative woman for an American. Other parents complained about her enigmatic aura. I am rarely intimidated by other people, mainly because of my inability to recognize or admit to their superiority. As a result, I tend to just plough ahead regardless, as I have discovered that life is just far too short, to be messing about with too many niceties. As she finished off her assessment of his progress, I launched in with my size tens, to quiz her about the losses. Where were they? Where had they gone and why? Miss E removed he spectacles and pinched the bridge of her nose, as she composed herself. I awaited enlightenment from this stalwart of the teaching profession, universally admired by all her colleagues. She told me, that in her view, children, especially our children, developed in their own unique way. It was her observation, over the years, that growth and progress could be viewed like a corkscrew at a angle – the child seems to be on the up, learning new things, blossoming, happier. 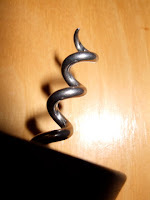 Then, for some unaccountable reason, they seemed to spiral down again, slipping over the curve in the corkscrew. She suggested, that when they’re in the ‘dip,’ curling around loop, they are really re-grouping their skills, filing them away, making them secure, a consolidation if you will, until they emerge and rise up the curve again, ready for the next cycle. I don’t know if it’s true, certainly not very scientific, but it’s a visual that helps me. Not everything has to be 'true' to be 'helpful,' does it? I hope this isn’t too irritating. I think I would find it irritating, but I find a lot of things annoying. My pal, “Jerry Grasso,” suggested it, so we’ll blame him instead, or at least I will. If you have not visited this blog before, do not be disorientated by the photograph of the lovely, smiling blond woman. That is not Jerry, as he is the dad, but he’s still a jolly good egg. Posted on March 24th, 2007. 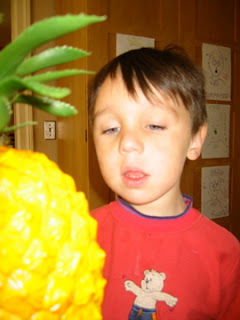 There are the big ones, like 'why does autism exist?' and then there are a whole host of other scientific issues, such as 'how can a four foot square cushion disappear?' although that is probably a physics question, or maybe a physical one. I think it's a mathematical problem involving 'cubic metres of child'[ren] versus volume of cushion, but weight to strength ratios would be a contributing factor or maybe a variable? This is not some namby pamby lightweight fluffy American cushion. Oh no! This is a heavy duty, won't dent if you punch it, dead body weight kind of a British cushion and probably pre-war although I can't authenticate that. 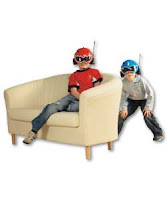 If your pincher grip is fair, the average cushion can be picked up by a corner and tossed through a gentle arc to the sofa. Our version is more like a collection of house bricks with a fabric coating for the sake of appearance and about as comfortable too. It doubles as a step if you need to reach a high cupboard. A building contractor or body builder might be able to heave it up and lob it, but on impact it would kill the victim stone dead. Even if this were not true, it's shear bulk means that you can't stick it up your jumper and pretend to be pregnant. We could be critical and list it's many faults as a household item, but the main point is that this is not something that is easy to lose. You need to try very hard to lose it. If we ignore it's deficiency of purpose, why would you want to lose it in the first place? Maybe the real question is 'who' would want to lose it, which in turn begs the question 'who' would be sufficiently motivated by 'what' to lose it? 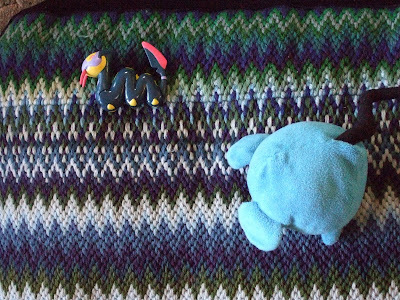 “What are the Pokemon doing on the cushionshttp://www2.blogger.com/img/gl.link.gif? Are they playing?” It is supposedly helpful to suggest an answer in the hope to trigger a response. “Dey are camouflaging.” Are they really? Not bad. Good colour match, if a little obvious now he comes to mention it, easily picked off by a sniper. There again, it's his brother that colour obsessed. Junior's “visual acuity” is usually second to none. “It is camouflage like “Gecky.”” Good follow up comment matey, and voluntary. Posted on March 21st, 2007.